- I celebrated Phagwah Holi Festival in NYC. Phagwah Holi Festival is the ritualistic Hindi Festival of Colors. THE COLORS OF HOLI ARE THROWN TO REPRESENT happiness, love, and the freedom to live vibrantly! When I first heard of Holi, it was in when I was living in Paris. I would see a bunch of Facebook events with photos of smiling faces and a happy mess of hot pink, bright orange, neon green and yellow powders. I didn't know much of what was going on but I knew it must be something spontaneous and free-spirited to participate in. Over a year had passed and I never attended a holi (or holi inspirired) event. A friend of mine living in NYC told me about a Holi festival in Queens and I said, "LET'S CHECK IT OUT, I've always wanted to go but never have! Do we have to wear white here too?" It was at the festival where I truly learned more about the celebration. Being present in the experience first hand, I felt that I was able to grasp the true essence of Holi. Even as every experience is different, the theme and meaning behind the holiday remains a rich source of connection to ourselves and others. Paul James Read, adorned in the vibrant colors of Holi, contributes to the celebration with his own Green throwing powder. Holi is a religious ritual celebrated in the HIndu tradition. It is a celebration held every calendar year with the exact dates based on the cycle of the moon. It is usually celebrated during a full or a new moon, to honor the commencement of spring. Holi is considered to be one of the most anticipated and revered festivals celebrated by the Hindu communities all around the world. People gather together to playfully smear colored powder on the faces of friends, foes, perfect strangers, adults and children a-like. TRY THIS HOLI RITUAL: Bhang Recipe on 4/20. Holi has inspired similar festivals, events, and artistic expression in popular culture. 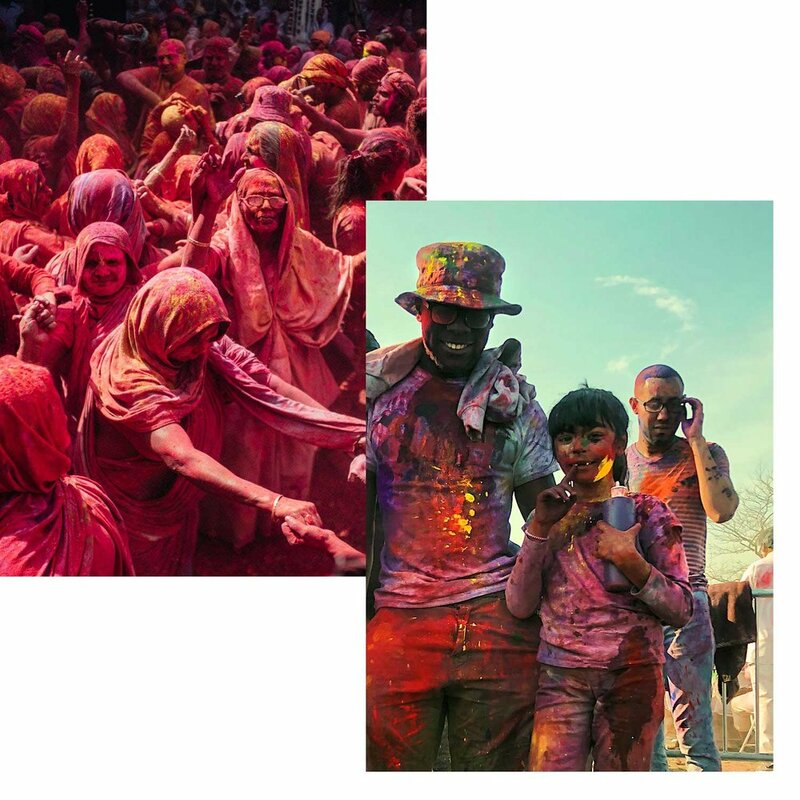 Coldplay's video for Hymn for The Weekend evokes the colors, ritual and tradition of the Holi Festival. Trevor, blessed in the Colors of Holi. IT'S ALL PLAY HERE! A FATHER AND DAUGHTER CELEBRATE THEIR INNER CHILD AND GET WILD IN THEIR OWN UNIQUE "Holi STYLE" TOGETHER AT THE HOLI FESTIVAL IN QUEENS, NYC. "Young Krishna is known to be very playful and mischievous. The story goes that as a child, Krishna was extremely jealous of Radha's fair complexion since he himself was very dark. One day, Krishna complained to his mother Yashoda about the injustice of nature which made Radha so fair and he so dark. To pacify the crying young Krishna, the doting mother asked him to go and colour Radha's face in whichever colour he wanted. In a mischievous mood, naughty Krishna heeded the advice of mother Yashoda and applied colour on her beloved Radha's face; Making her one like himself. Well, there is also a legend to explain Krishna's dark complexion. It so happened that once a demon attempted to kill infant Krishna by giving him poisoned milk. Because of which Krishna turned blue. But Krishna did not die and the demon shriveled up into ashes. 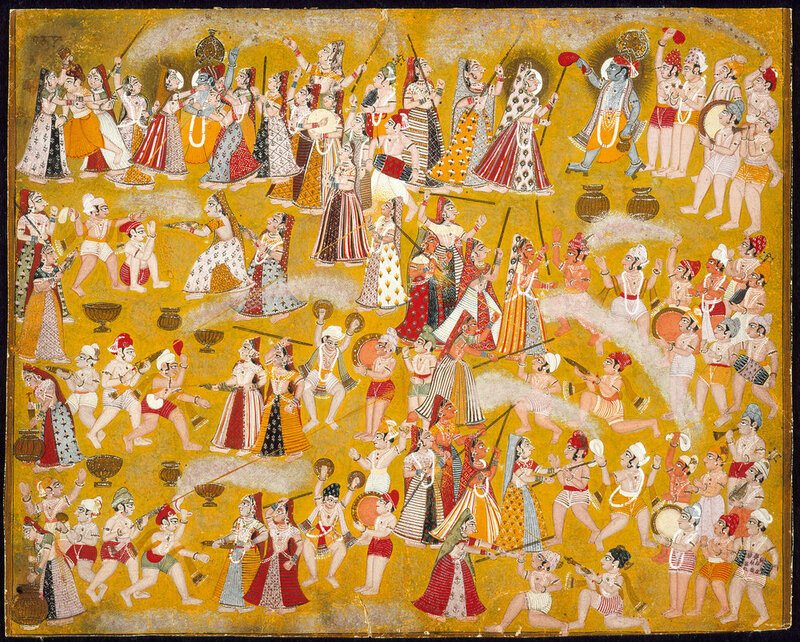 The beautiful scene of Krishna's prank in which he played colour with Radha and other gopis has been made alive in myriad forms in a number of paintings and murals." Leo Henry and Tara Lynn Faith playing with colors at Holi Festival in Queens. JOIN IN THE NEXT HOLI! This year I went to Holi at Smokey Oval Park with some friends to celebrate Spring, friendship, equality, organized by the people of the Caribbean that are Indian descendants. The colored powders used in Holi represent happiness, love, and the freedom to live vibrantly. Vendor was selling simple and delicious food in exchange for donations (I also spotted some colored cotton candy, too). Kesha + friends wearing Holi color on their uniforms while rocking the 3 most classic comfortable kicks. Join us next time! Sign-up for our newsletter and get invited to whatever's happening.